TSN GO is a free app for iOS and Android devices, which enables users to watch TSN and TSN2 on the go. 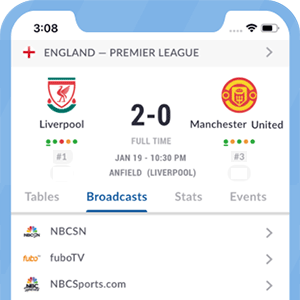 This streaming service enables soccer fans to watch matches live and on-demand, on their smartphone, tablet or computer. TSN GO comes free with a subscription to participating TV service providers. It is currently available to Bell TV and Rogers customers. *Got itLive Soccer TV does not provide TSN GO live streaming. The information provided on this page is simply TSN GO soccer TV schedule.